Nautical inspiration gives this sturdy tote a fashionable, timeless look. 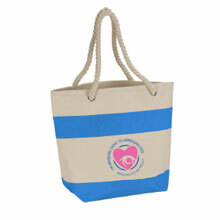 Natural-colored cotton canvas, thick stripes and rope handles will remind you of the open sea. Open main compartment holds a boatload of daily gear, good shopping deals, beach supplies and more. Thick, sturdy 24″ rope handles are reinforced with classic metal grommets. Made from 12-oz 100% cotton canvas for durable, everyday use. Size: 13-1/4″ x 18″ x 6-3/4″ bottom gusset.